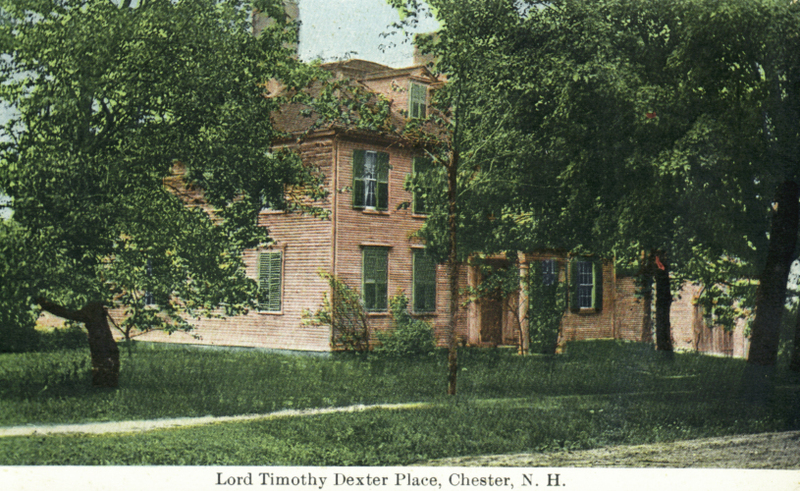 The “Dexter house”, which is one of the finest old houses in Chester, was built by Tappan Webster in 1787. The high roof was formally ornamented, as was the fashion then, with a railing. In the early days, there were two stables connected with the place, for the Tappan Webster House was for many years a tavern of the best sort, which did a thriving business. In good sleighing, it was not an uncommon thing for 50 teams carrying produce to the market with the 50 drivers and 100 horses to pass the night at this tavern. His wife eloped with a handsome young lawyer that he engaged to help collect his debts, and he later went to Washington where he died. 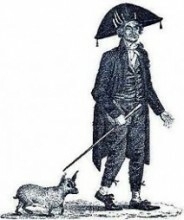 Lord Timothy Dexter, a most eccentric and conceited man bought the place and lived there are a few years. He paved the yard from his stable to the street with granite slabs, he offered to pave Chester Street also if they would call it “Dexter Street”, the offer was refused. Many stories are told of his peculiarities. A wag once advised him to send warming plans to the West Indies as the place was poorly supplied. He did and they were so useful for dipping molasses that he made a fortune. He used to keep a casket in his front hall and at one time he got in it and had a funeral that he might see how people would act if he were dead. He tried his hand at writing a book, “A Pickle for the Knowing”, (“The Art of Making Money Plenty” LCN), but without any marks of punctuation, but with several pages of “stops” (punctuation marks LCN) to be used as one wished (with the admonition “salt and pepper to taste” LCN). How many men, who smoke, know that the T.D. pipe was named for Timothy Dexter? Later it was the home Ephraim Orcutt and his wife, Susan D. Hazleton. This grand old house later was owned by Amos Tuck French, who tore down the stable and built the piazza on the east side of the house. He made some improvements on the interior, but in the main, he kept as it was. From the granite paving stones, he built the sunken garden and, with its well-kept lawn, it stands a monument to the substantial men who planned our town so many years ago. This home stayed in the French family for over 100 years.